ROTA, SPAIN – A 1992 Kingston Technical High School (Jamaica) graduate and North Lauderdale, Florida native is serving our country in the Navy, living on the coast of Spain, and participating in a critical NATO ballistic missile defense (BMD) mission while assigned to the guided-missile destroyer USS Donald Cook. 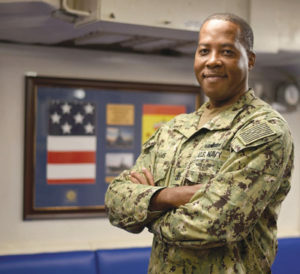 Chief Petty Officer Morlan Adams is a personnel specialist aboard one of the four advanced warships forward-deployed to Rota, Spain, a small village on the country’s southwest coast 65 miles south of the city of Seville. A Navy chief personnel specialist is responsible for sailors receiving financial entitlement in a timely manner and monitoring the appropriate number of personnel who are assigned to the ship to meet our mission. Adams credits success in the Navy with lessons learned growing up in North Lauderdale. These four destroyers are forward-deployed in Rota to fulfill the United States’ phased commitment to NATO BMD while also carrying out a wide range of missions to support the security of Europe. According to the NATO website, many countries have or are trying to develop ballistic missiles. The ability to acquire these capabilities does not necessarily mean there is an immediate intent to attack NATO, but that the alliance has a responsibility to take any possible threat into account as part of its core task of collective defense. U.S. Navy Aegis ballistic missile defense provides scalability, flexibility and mobility. These systems are equally beneficial to U.S. assets, allies and regional partners in all areas of the world. Positioning four ballistic missile defense ships in Spain provides an umbrella of protection to forward-deployed forces, friends and allies while contributing to a broader defense of the United States. Guided-missile destroyers are 510 feet long warships that provide multi-mission offensive and defensive capabilities. The ships are armed with tomahawk cruise missiles, advanced gun systems, close-in gun systems and long-range missiles to counter the threat to friendly forces posed by manned aircraft, anti-ship, cruise and tactical ballistic missiles.